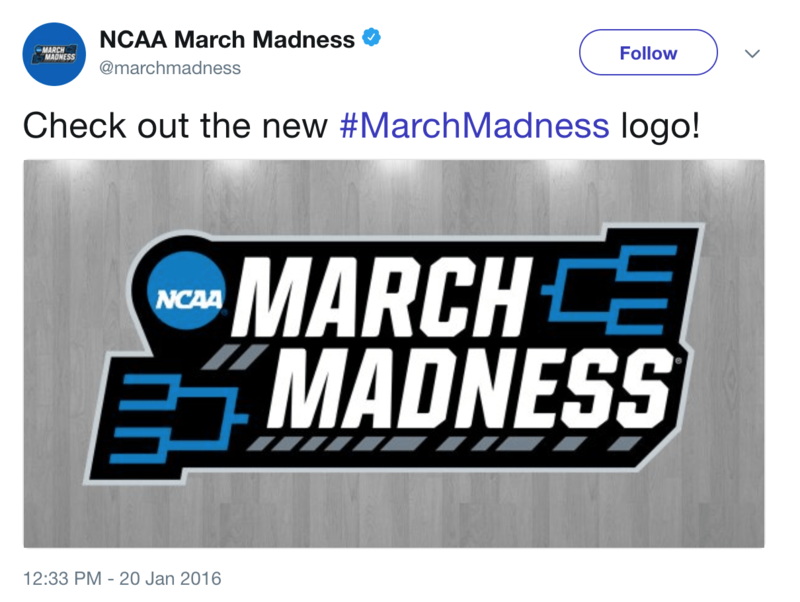 Is It Legal to Use The Trademark MARCH MADNESS In Marketing? 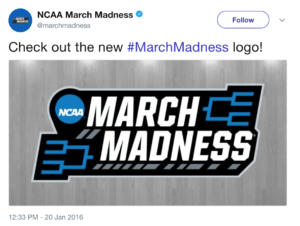 Entrepreneurs and technology startups may consider using the popular MARCH MADNESS ® Trademark or FINAL FOUR® Trademark in their marketing and promotion, particularly around the time of the NCAA Division I Men’s Basketball Tournament. The term MARCH MADNESS ® is a federally registered trademark on the United States Patent and Trademark Office (USPTO) under Registration No. 1571340 with a priority date of March 10, 1986. Furthermore, the term FINAL FOUR® is a federally registered trademark on the USPTO under Registration No. 1488836 with a 1977 priority date. Both marks are filed in International Class 041 for entertainment services and conducting annual basketball tournaments at the college level. Thus the question becomes whether the use of the registered trademark is fair use, or potentially unauthorized in the absence of an express written consent from the owner, The National Collegiate Athletic Association (NCAA). This carries a substantial legal risk of trademark infringement. It is well known that the NCAA vigorously polices its MARCH MADNESS ® and FINAL FOUR® trademarks against businesses seeking to profit off unauthorized use of the term on apparel goods, general merchandise, on websites or mobile applications, in advertising for services ranging from dining to tax services, and various other goods. 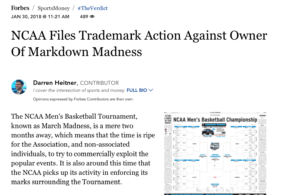 The bottom line is, any promotion on or offline that uses the term MARCH MADNESS ® or FINAL FOUR® or even reference to the game, could face a cease and desist letter or alleged trademark infringement from the NCAA. 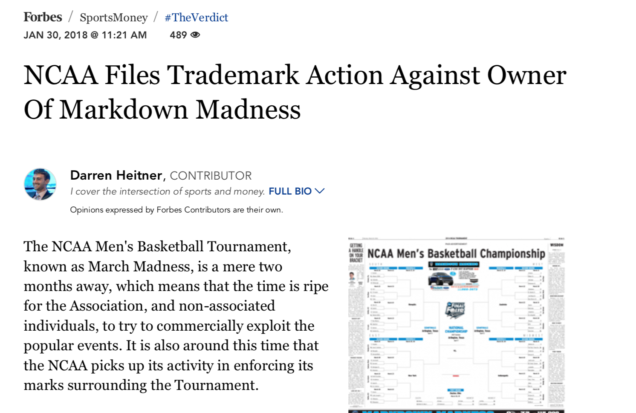 For example, in January 2018 Forbes reported the NCAA filed a federal trademark infringement lawsuit against a car dealership because they were using the term “Markdown Madness” in their marketing. While the lawsuit is pending at this time, just the cost of litigation is likely to make the promotion not worth the trouble, not to mention potential exposure to trademark infringement damages. The NCAA Men’s Basketball Tournament is a cash cow for the organization. In 2013, 81% of the NCAA’s $870 million in revenues came from media rights, a substantial portion of which is generated during the single elimination tournament happening in March each year. 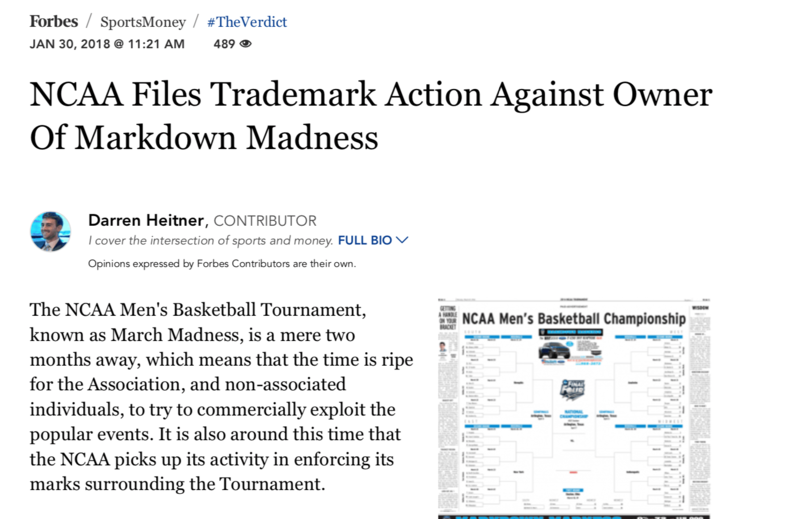 This means using the MARCH MADNESS ® or FINAL FOUR® mark without authorization can potentially devalue one of the NCAA’s most profitable and recognizable intellectual property assets. The NCAA will defend its trademark rights against potential infringement under likelihood of confusion or other laws related to trademark protection in the United States. Entrepreneurs seeking to engage their customers around the time of the March Madness ® or Final Four® tournaments should exercise caution and common sense. As well as consult an experienced trademark attorney who is also knowledgeable in advertising law to receive an opinion on the scope of risk by way of their planned use of the NCAA’s March Madness ® or Final Four® trademark assets. 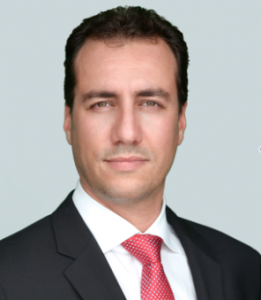 Failure to do so could mean game over for technology startups and small businesses.